A4 Size 7.3 x 10.0 in. (186 x 254 mm) 8.3 x 11.7 in. A4 Mounted 7.3 x 10.0 in. (186 x 254 mm) 11 x 14 in. A3 Size 10.7 x 14.7 in. (272 x 374 mm) 11.7 x 16.5 in. 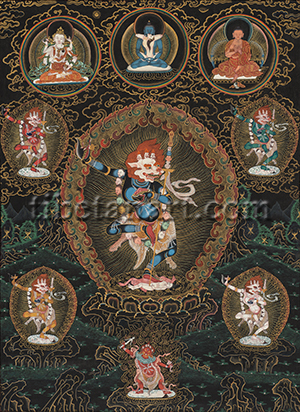 Although not a masterpiece, this thangka of Simhamukha with her retinue of four dakinis is a somewhat rare composition that was commissioned by a student of Namkhai Norbu Rinpoche back in the 1990’s. The original sketch for this painting was drawn by the late Phunsok Tsering from Sikkim, and then painted by a Tamang artist from the Kathmandu Valley. After some deliberation I have decided to make this piece available as a small Giclee print, in the hope that it will be of value to students of Namkhai Norbu who wish to perform the practice of this deity. Within the Nyingma tradition the ‘Lion-faced Dakini’ Simhamukha (Tib. seng ge dong ma) is an important yidam or meditation deity of the wisdom or ‘mother class’ of tantras, and recognized as a wrathful manifestation of Guhyajnana Dakini, the ‘Secret wisdom dakini’, who was the main female teacher of Guru Rinpoche. In this respect she is regarded as the ‘Queen of Dakinis’ in the terma or ‘revealed treasure’ traditions, and also as the secret aspect that Guru Rinpoche assumed while receiving empowerments from Guhyajnana Dakini in Vajrasana or Bodh Gaya. In Sanskrit she may also be known as Simhavaktra or Simhamukhi, and her various sadhana practices are essentially designed to prolong life and eliminate obstacles to spiritual development. Practices of Simhamukha also exist within the Sarma or ‘new translation’ schools of the Sakya, Kagyu and Gelug traditions. However, these transmissions arise from the Chakrasamvara cycle of Highest Yoga Tantras, which are quite distinct from the terma cycles of the Nyingma or ‘old translation’ schools of Tibetan Buddhism. Simhamukha is wrathful and dark blue in colour, with the fierce and frowning head of a white lion that gazes to the left. Her leonine face has two round and bloodshot yellow eyes, a gaping mouth that reveals her sharp teeth and long red tongue, and the tawny-red hair of her eyebrows and mane flows upwards above her five-skull crown. Her nubile body is adorned with gold bracelets, armlets and anklets; the five bone ornaments of a dakini; a tiger-skin loincloth, and a long garland of fifty freshly severed and blood-dripping heads. She stands in dancing bow-and-arrow posture with her right leg drawn up and her left leg extended, as her left foot tramples upon the breasts of a male and female corpse that both lie prone upon her sun-disc and lotus seat. With her right hand she holds aloft a vajra-handled curved knife that she circles towards the ten directions, and with her left hand she holds a blood-filled skull-cup in front of her heart. In the crook of her left arm she supports her tantric-staff or khatvanga, which is adorned with a golden crossed-vajra and nectar vase, a billowing white silk ribbon, a freshly severed head, a decaying head, a dry white skull, and the crowning symbol of a golden vajra. Light rays emanate from her radiant blue-black body, and she abides within a blazing circle of awareness fire. Surrounding Simhamukha in the cardinal directions is her retinue of four dakinis, who are all identical in form to her except for their body colours, the single corpse-seats that they stand upon, and their trident-topped khatvangas. White Buddha Simhamukha of the Tahagata or Buddha Family appears in the east (lower right), and her main function is to pacify all negative circumstances and to promote healing. Yellow Ratna Simhamukha of the Ratna or Jewel Family appears in the south (lower left), and her main function is enrich all positive circumstances, and to increase wealth or prosperity. Red Padma Simhamukha of the Padma or Lotus Family appears in the west (upper left), and her main function is to enchant all beings and bring them under her control. Green Karma Simhamukha of the Karma or Action Family appears in the north (upper right), and main her function is to vanquish or annihilate all negative obstructions or demonic forces. Directly below Simhamukha is the fierce form of Ekajati (Tib. ral chig ma), the ‘Single (eka) hair-lock (jati)’. As a protector of both the Dzogchen and Terma traditions and a guardian of mantras, Ekajati is extremely wrathful and dark-red in colour, with a single sagging breast, one sharply pointed fang, one baleful red eye that stares piercingly from her forehead, and a single braided ‘iron’ hair-lock that rises up from the crown of her head. She wears bone ornaments, a five-skull crown, a tiger-skin loincloth, a ‘cloud-collar’ made from blue and indigo storm clouds, a long garland of fifty dry white skulls, and a human-skin cloak that hangs behind her back. With her right hand she wields aloft a club made from a mummified human corpse, and with her left hand she holds the warm and blood-dripping heart of an enemy. She stands in pratyalidha posture, with her two feet crushing underfoot a demonic enemy that lies upon her sun and lotus seat, and she abides within a blazing mass of awareness fire. Across the top of the composition and depicted within circular bindu (Tib. thig le), or ‘seminal spheres of rainbow light', are the three principal lineage gurus of the Dzogchen Atiyoga teachings, Samantabhadra (centre), Vajrasattva (left), and Garab Dorje (right). Respectively these three figures correspond to the three kayas or ‘divine-bodies’ of a Buddha, with Samantabhadra representing the purity of consciousness as the dharmakaya (Tib. chos sku) or ‘Buddha-body of Reality’; Vajrasattva representing the sambhoghakaya (Tib. longs sku) as the ‘Enjoyment-body of Perfect Resource’; and Garab Dorje representing the nirmanakaya or ‘Emanation-body of physical form, which is known in Tibetan as a ‘tulku’ (sprul sku). Essentially this implies that Samantabhadra was the primordial source of the Dzogchen transmissions, which were then transmitted into the human world by Vajrasattva, who appeared in the visionary form of the Bodhisattva Adhicitta to reveal these teaching to Garab Dorje, as the first human guru of the Dzogchen lineage. Blue Samantabhadra (Tib. kun tu zang po), meaning the ‘All-good’ or ‘Ever perfect’, appears here in his non-dual aspect with his white consort Samantabhadri. They are both naked and unadorned, and sit together in the ‘father-mother’ (yab-yum) posture of sexual union and meditative equipoise, known as the ‘Supreme Joy’. Vajrasattva or Dorje Sempa (rdo rje sems dpa), meaning the ‘Indestructible being’, is youthful, peaceful and white in colour, and endowed with all the major and minor marks of an enlightened being. He sits in vajra-posture upon his moon-disc and lotus in sexual union with his white consort, Vajragarvi or Dorje Nyenma (rdo rje nye ma) the ‘Lady of Vajra-Pride’, and both are adorned with the five divine silk garments and eight jeweled ornaments of sambhoghakaya deities. With his right hand he holds a golden vajra in front of his heart, and with his left hand a silver bell at the level of his hip. While his consort holds a skull-cup and a curved knife in her left and right hands. Garab Dorje (dga’ rab rdo rje) is the Tibetan name of an early Indian master whose Sanskrit equivalent is Prahevajra or Pramodavajra. He is believed to have been born in the kingdom of Uddiyana in Western India in the 1st century AD, and is credited with revealing the ‘seventeen tantras’ of the esoteric lineage of Dzogchen or the ‘Great Perfection’. He appears here in the nirmanakaya form of a Buddha, wearing the three dull red robes of a monk, with his hands in the ‘wheel-turning’ or dharmachakra-mudra of teaching. He is seated on a mat, with a cushion behind him and his alms-bowl in front of him.